We manufacture a wide variety of seals made according to your specifications. 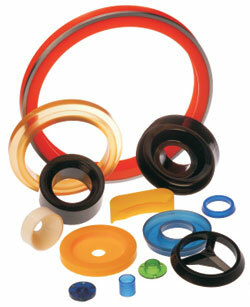 Urethane seals provide excellent abrasion resistance, elasticity and rebound. Seals can be manufactured to accommodate tight tolerances and can be produced economically in high volumes. We offer a wide range of colors and durometers which enables us to meet your requirements. We has an in house machine shop to fabricate tooling and an engineering staff to assist you in your concept.